I am back from vacation and totally out of practice - could not get into my card room yesterday - no inspiration, whatsoever....but today with a looming deadline over at Freshly Made Sketches - would not want to miss their fantastic celebration!!!!! Yeahh for Freshly Made Sketches - BIG CONGRATS!!!!! So pleased with the outcome - its just an amazing technique. Using my new WRMK (We're Memory Keepers) embossing folder. Inked with distress inks and Perfect Pearls. The sentiment and die cut are by Papertrey. The little butterfly is a punch by Martha Stewart. Used some Washi tape and glossy accents. Here is another view - just love the way it looks. So, wanna know what I did on vacation? Guess - I met THE FAMOUS, FABULOUS, ONLY TENIA NELSON from Jazzy paper Design! From left to right - my hubby, my son, me, Tenia, her adorable son and wonderful husband. We had a delicious meal together and it was FUN! Your faux metal technique is fabulous ! Beautiful card! How cool you met Tenia! Thank you for helping us celebrate 200 at Freshly Made Sketches! I sooooo LURVE your AWESOME card, girl!! I am so happy that we were able to meet up!! You have an amazing family!! YAY!! 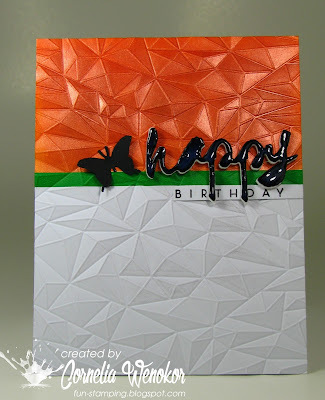 This is one embossing folder I HAVE 2 have! You do the coolest stuff Cornelia! This looks awesome and not a tad out of touch! How awesome to meet Tenia! 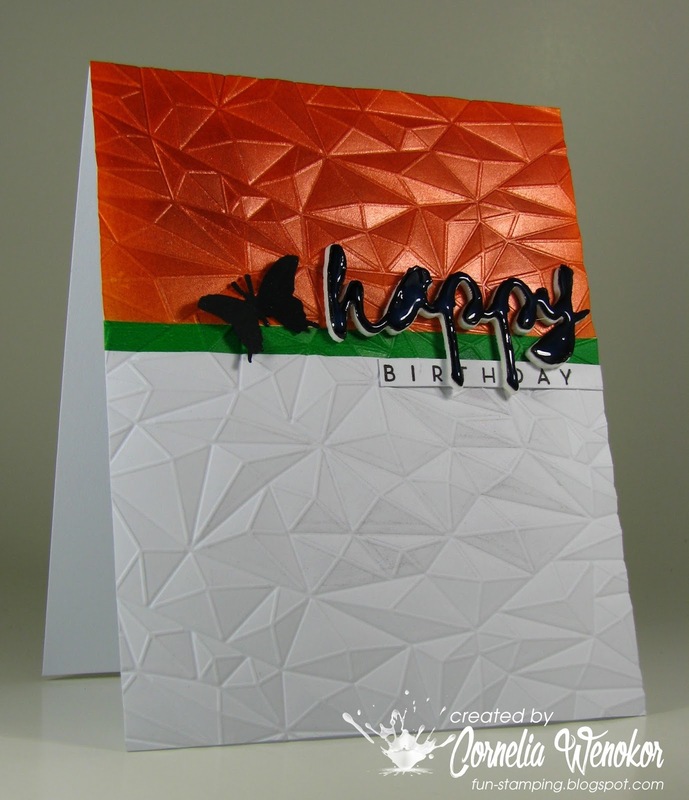 LOVE your card, the texture and shimmer are GORGEOUS!!! I love that ef Cornelia, and a fab card you made with it. It is a beautiful card ! Great technique ! Das ist wirklich spannend, Blog-Freunde zu treffen, die man ja wirklich nicht so richtig kennt, nur vom hin- und herschreiben. Deine Karte ist wieder einmal sehr schön und elegant. 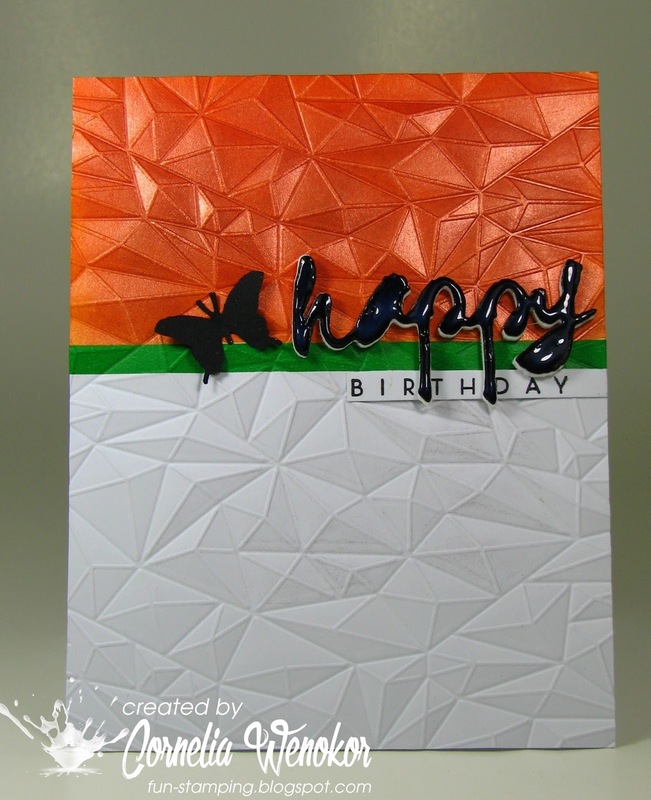 Amazing card, Cornelia! So awesome you got to meet Tenia! Love the pictures! Thanks for sharing. Wow, what a stunning card and such a great technique Cornelia! A beautiful result. We missed you wile you were away, how great that you got to meet up with Tenia - lovely photos! I love the embossed sections of this gorgeous card! Great job on your submission for the FMS sketch challenge. Beautiful card, simple and very pretty. what does "WRMK" stand for? Well, shut my mouth. If that card isn't the winner I, for one, will want to know why. It's incredible. Actually stunning. I still can't get the drool off my chin (ooh, that's sounds gross). Better to say A-MAZ-iING. And you got to meet with Tenia and family. What fun. Let's see, did you talk about cardmaking??? Thanks so much for sharing this beauty. Such a beautiful card Cornelia! Love that technique. The colour is so vibrant! Thanks for joining us for our 200th sketch celebration at Freshly Made Sketches! Fabulous, Cornelia! Love the sheen. How cool that you and Tenia were able to meet up! What a fun card! Love that faux metal! I'm so glad you joined us this week at the Color Throwdown! And how lucky you meet the Beruhmte Tenia..